Reji Abraham holds a Bachelor's degree in Engineering. He is the managing Director of Aban Offshore Ltd, Director of Aban Australia Pty Ltd, Chairman of Aban Power Company Ltd and Managing Trustee of Aban Cares. His passion for alternative fuels and renewable energy is evident from the fact that Aban Australia Pty Ltd has invested about USD 4 million in Muradel Pty Ltd and SQC Pty Ltd since 2006. Mr. Venkateswaran holds a B.Tech degree from IIT, Madras. He is currently Deputy Managing Director of Aban Offshore Ltd and Director of Aban Singapore Pte Ltd, Aban International Norway AS and Sinvest AS. Sailendra Bhaskar graduated with honours in Agriculture and Animal Husbandry from the G B Pant University of Agriculture and Technology where he was an Indira Gandhi Scholar. He went on to join the Indian Agricultural Research Institute in New Delhi for a Masters in Agronomy and Genetics - while at the IARI he was awarded the Sir Dorabji Tata Fellowship. He joined the Indian arm of the French Consulting company Groupe Bossard and spent over ten years working on various projects ranging from introduction of Food Irradiation Technologies in the Far East to the manufacture of Solar Photo Voltaic Panels in India. He has always had a strong interest in Appropriate Technologies and has been an active proponent of sustainable agriculture and renewable energy since the early eighties of the last millennium. He later joined the Accel Ltd to build their Training and Education portfolio with a view towards introduction of non-programming based computer literacy in schools across India and other developing economies. He also helped set up Accel's US operations. Sailendra Bhaskar hosted a thrice-weekly talk show on AsiaNet Satellite Television (Computalk) for three years (1995-1998) focusing on lay users and their use of Computer and Communication Technologies. Since 1999 he has been with the Aban Group where his responsibilities include developing IT solutions for the Group's offshore rig fleet and later for the deployment of some of these technologies and services for Fortune 50 clients in Europe. 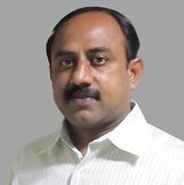 Dr.Senthil Chinnasamy heads the Biotechnology Division of ABAN group based in Chennai as Chief Technology Officer. He leads ABAN's R&D projects to develop commercial-scale technologies for the production of biofuels/bioenergy/bioproducts/green chemicals from algae and other carbonaceous biomass feedstocks. He holds a Bachelor's degree in Agriculture from Tamilnadu Agricultural University, India. He received his Masters and Doctorate in Microbiology from Indian Agricultural Research Institute (IARI), New Delhi, India. He also worked for Indian Council of Agricultural Research (ICAR) as Scientist from 1995 to 1996. He has over 10 years of industrial experience in heading the R&D operations at a sugar/ethanol industry in South India with major focus on waste management, composting, pollution control and development of novel bio/organic inputs like biofertilizers, growth promoters and biocontrol agents to promote sustainable agriculture. He worked as Post Doctoral Fellow and Research Engineer at the Department of Agricultural and Biological Engineering, University of Georgia (UGA) in USA from 2007 to 2010. During 2007, he initiated and led microalgae biofuels and anaerobic digestion research programs at the University of Georgia under Biorefining and Carbon Cycling Program funded by US Department of Energy (DOE) at the Department of Biological and Agricultural Engineering. In the past 6 years, he has published 18 papers related to algae biofuels in peer reviewed journals. He holds three US patents and has 6 patents pending in the area of biofuels and bioenergy. He is currently a Member of the Executive council of the Asia-Pacific Society for Applied Phycology (APSAP). He also serves as a member of Technical Advisory Committee of Muradel Pty Ltd - a joint venture algae start-up company between University of Adelaide, Murdoch University and SQC Pty Ltd in Australia. Dr. Sachitra Kumar Ratha is the chief scientist charged with looking after both the indoor and outdoor cultivation of algae at Aban's R & D facility. He has a M.Sc. (Botany) with Microbial biotechnology specialization from Berhampur University in the year 2000 and subsequently obtained M.Phil. degree from the same University in 2002. After his M Phil he joined as Junior Research Fellow (2002-2003) in the Project "Coastal Economic Dimensions and Action Plan for Conservation of Bioresoureces: Chilika Lake" - the report was submitted to the M.S. Swaminathan Research Foundation, Chennai, India in 2003. He joined as a Junior Research Fellow in late 2003 in the All India coordinated project on Taxonomy of freshwater algae supported by a fellowship from Ministry of Environment and Forest, Govt. of India. He was later promoted to SRF in 2005 in the same project. He was the key scholar in documenting the freshwater algal taxa of Eastern region of India under the project for five consecutive years (2003-2008) which work led to his PhD (2010). He has worked as Post-doctoral Fellow at the Division of Microbiology, Indian Agricultural Research Institute (2010-2012) on algal biodiesel aspects. He has thus far published twenty one research papers in national & international peer reviewed journals and is a life member of Association of Microbiologists of India. Kanchan did his Bachelor's degree from SRM University, Chennai and holds a Master's degree from University of Manchester, UK. Previously involved in the Government of India Department of Biotechnology's "National Algal Biofuel Network" project. He has over three years of experience in Screening, Isolation and Characterization of microalgae in North East Region while working as a Research Associate at TERI- The Energy and Resources Institute. Under the project he has isolated 181 unialgal cultures covering from the lower regions of Assam and Barak Valley. As Research Officer at Aban's Algal R & D unit he is responsible for in house R&D on a variety of algal strains. Mr. Nallasivam is currently working as an Assistant Research Officer in Biotechnology Division of ABAN Infrastructure Private Limited. He has a B. Tech - Petroleum Refining and Petrochemicals from Anna University, Chennai. He is charged with handling the Thermo-Chemical Liquefaction of algae and other feed stocks at Aban's Thandalam R & D facility. 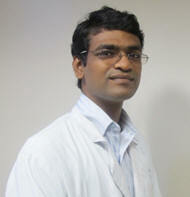 He also works closely with Chennai Petroleum Corporation Limited, Chennai on up gradation of algal bio-crude. 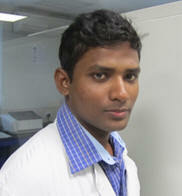 Sam holds a bachelor degree - B tech in Biotechnology. As Asst Research Officer his focus is on carrying out biochemical analysis of algal biomass, nutrient analysis and protein extraction. He has also works on mass cultivation of microalgae for biomass production and is currently working on medium optimization for marine algae.